Starting Today, August 12 and every Tuesday, locals with a Nevada ID receive 30% off High Roller tickets, plus a complimentary drink at the Sky Lounge. Live entertainment and music continue to drive the energy of the Tuesday night BLOQ Party celebrations with DJs, break dancers, taiko drum performances and live art beginning at 8 p.m. at F.A.M.E., the new Asian night market. Silent Disco takes place just across the way at The LINQ Fountains from 9:30 p.m. to 12:30 a.m. and is open to all ages and free to the public. Artists will continue to actively showcase their work throughout the promenade during The LINQ Mural Project from 7 p.m. to 11 p.m. at BLOQ PARTY Tuesdays. Tilted Kilt: 20% off entire check (including retail); $4 Sam Adams, Sam Seasonal, Lagunitas 14oz draught; $5 PBR 32oz draught; $5 Pinnacle Vodka single mix spirits (energy not included); and FREE Buffalo Chicken Dip and Chips with purchase of any two entrees. Youth pricing is for ages 13-17. Children 12 and under are free. 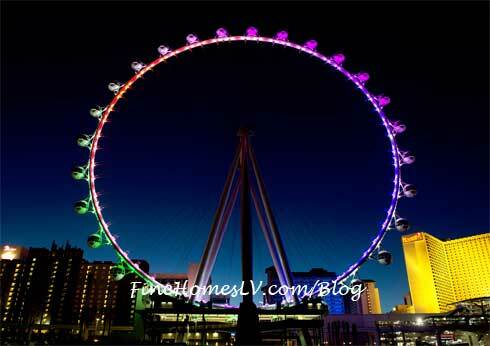 Valet and self-parking are conveniently located under the High Roller observation wheel, with access via Flamingo Road.